Whether you’re already in a sorority, looking to join one, or simply just enjoy the area, apartments near UF Sorority Row create one of the best and most sociable neighborhoods in Gainesville. 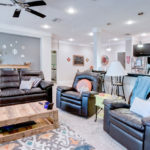 Trimark Properties specializes in luxury apartments in Gainesville FL, offering properties like Solaria Luxury Apartments, Royale Palms Luxury Apartments, and Tuscana Luxury Apartments. These properties are just a few of your options when looking for a new home in this great area. This property is one of the closest apartment near UF Sorority Row, only steps away from campus, Norman Hall, and sorority houses. Offering unparalleled amenities including large master bedrooms with attached private bathrooms, and luxury kitchen areas that contain granite countertops, built-in wine racks in some units, and custom wood cabinetry. Select units offer a view on a private balcony with porch swings. Floorplans offer studio apartments up to three bedrooms. The three bedroom apartments are available as two-story townhouses for residents looking for extra space. Covered parking is also available in an on-site parking garage. This area in Gainesville is prime location for students wanting to live in apartments close to UF Sorority Row. This Spanish-influenced property exudes both luxury and convenience due to its unbeatable amenities and great location. In select units, experience comfort on a private balcony’s swing. Or, practice your cooking skills in one of Solaria’s gourmet kitchens that contain wood cabinetry and granite countertops. A few unique amenities offered by some units are custom bookcases, glass shelving and decorative art nooks. These amenities offer extra storage to residents and a homey feel. Because of Solaria’s close proximity to Kappa Alpha Theta and other houses on UF sorority row in Gainesville, a meal or chapter meeting is just a few steps away. This recently constructed property is one of the nicest apartments in Gainesville. Built with a Tuscan flair, Tuscana offers its residents a picturesque view of the nearby park and creek, with select units extending to a private porch with balconies overlooking the scenic view. Tuscana was built with luxury in mind since each apartment includes a gourmet kitchen with granite countertops, master suite bedrooms with attached bathrooms, and a spacious living room with elevated ceilings. Select units also contain electric wine coolers in the kitchen, an unparalleled amenity. Last but not least, Tuscana is in a great location because of the mere two minute walk from sorority row, which makes it the most coveted apartment near UF sorority row in Gainesville. Royale Palms is one of the closest apartments to both Sorority Row and the University of Florida campus. Forget having a car, you can walk to destinations like Shands Hospital or Norman Hall while living at Royale Palms. Each of Royale Palms’ units are outfitted with master suite bedrooms with a privacy-lock door, oversized closets, big windows and private bathrooms. Some units have large balconies attached with the fun addition of porch swings. The gourmet kitchens contain maple cabinetry and an elevated bar to sit and eat breakfast at. Additionally, there is always 24 hour emergency maintenance and night manager service available for all residents. 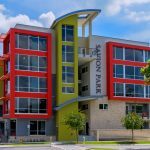 Recently built in 2014, Savion Park offers floorplans ranging from a studio apartment to four bedrooms. Built using the inspiration of a New York apartment in mind, Savion Park is one of the nicest apartments in Gainesville. Select units feature floor to ceiling windows, built-in wine racks, and walk-in closets. Each private bathroom contains a full-size tub with oversized ceramic stone tile flooring. In each adjoined private bedroom, there is a high-speed Ethernet port and elevated ceilings which are seen in all rooms. Each kitchen is a chef’s dream, complete with brand new stainless steel appliances and a raised breakfast bar. Get a Piece of NYC right here in Gainesville and enjoy being right next to UF Sorority Row.